Zeus (Pan Andreas) is an LAPD (?) cop who shoots first and lets his thick Greek accent do the talking. After a shootout with some baddies where his partner dies (though not before warning Zeus first to “not get soft”), Zeus has to turn in his badge and gun. While his family is concerned about him, especially his wife Shannon (Carol Dingman), the CIA picks up the slack and recruits – or, if we may paraphrase Steele Justice – unleashes Zeus on the unsuspecting bad guy population. 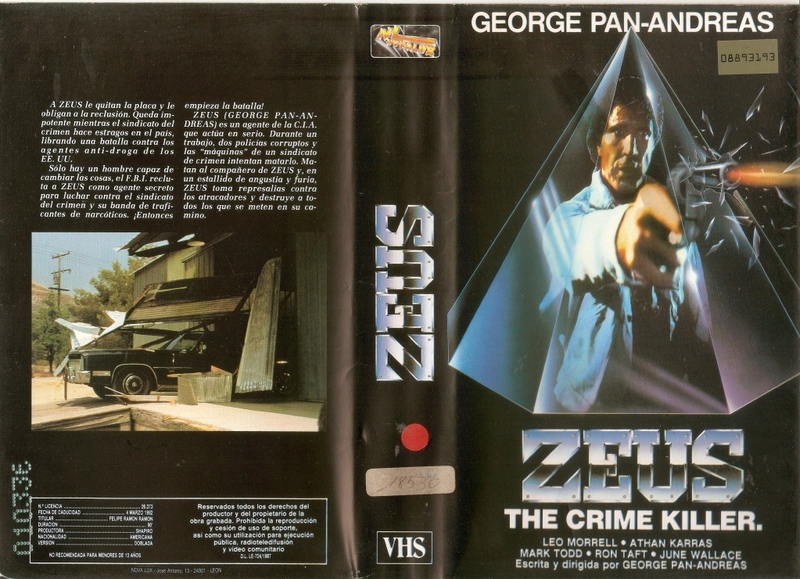 After some unnecessary boot camp training, Zeus is finally ready to rid the streets of crime – by killing it, of course – and living up to the President of the United States’s (Jack Bliesener) (yes, the President himself makes a personal appearance because he’s so impressed by Zeus's) promise to rid the streets of crime. Opa! We know what you’re thinking: “I love the Dirty Harry movies, but the only flaw is that Clint Eastwood isn’t Greek enough.” Well, problem solved, my friend. Problem solved. Our latest hero, the great George Pan Andreas, is Dirty Hercules as he sends the baddies to hades. The video store era was fantastic for many reasons, but one particularly stands out here: how one man (or, in the case of Renee Harmon, a woman) can achieve their dream of making a movie and getting it onto video store shelves, regardless of their level of English proficiency. Sometimes, one gem is created, like Pan Andreas did here, or Jorgo Ognenovski did much later, and sometimes a wildly successful career is forged, as in the case of Arnold Schwarzenegger. Our favorite thing that happens in some of these movies – or, should we say, doesn’t happen – is when other characters don’t acknowledge their thick accent in any way. Here, though, an angry CIA guy admonishes Zeus, “You and your accent will never change!” So, they were aware of it, but they forged ahead anyway. And the results are indeed something special. While it doesn’t quite reach the heights of classics like Samurai Cop (1991) or Miami Connection (1987), it comes very, very close. It has that off-kilter, funny, “what were they thinking?” vibe which we all love and enjoy. It’s also very similar to Revolt (1986). Vinegar Syndrome, Drafthouse, or Arrow should do a Blu-Ray of this movie. Then its charms will come more into the light, as they should, not languishing on a New World VHS, as we were able to see it. While the movie, presumably, is supposed to be a gritty, street-level exploration of the nature of crime and its titular killer, the first thing the audience sees when it pops in the VHS is some bizarre imagery, including – and we kid you not – an ancient Greek statue shooting laser beams out of its eyes. And that’s during the opening credits. After that, we were truly prepared for anything. 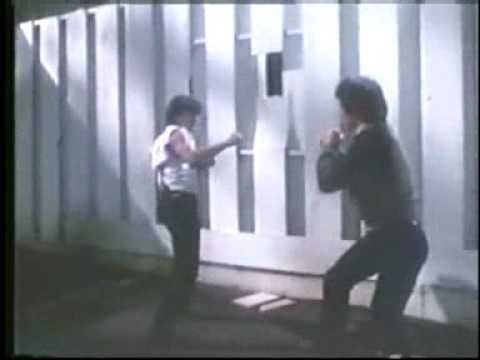 Then there were some silly fights, some sillier shootouts, some hilarious dialogue scenes, and it all culminates in the classic Final Warehouse Fight. Which is also really silly. Well, there’s one more scene after that, but we won’t spoil the magic. In that aforementioned credits sequence, under the name George Michaelides, it states, and we quote, “We thank you, we love you, God bless your soul”. We can’t say we’ve seen that before, but there are a lot of creative editing decisions in the movie. And guess who the editor is? We’ll give you two hints. He’s a modern-day Greek God, and his initials are GPA. Of course, Zeus has the time-honored WYC (White Yelling Chief), and some of their exchanges are gold, but in this case it might be more accurate to call him a WYCWBFHWLELRT, which of course stands for “White Yelling Chief With Bizarre Facial Hair Who Looks Exactly Like Rip Taylor”. Just why, amongst all the potential Chiefs Pan Andreas could have chosen, he went with Morrell, remains unclear. Maybe Rip Taylor was busy filming Virtual Combat (1995) ten years in the future. Who knows? But thank goodness he did. A movie highlight occurs when, going undercover to the lair of the baddies, Zeus goes all-out with his adeptness as a master of disguise. He assumes a new identity as a Mexican gardener at the baddie’s compound. By that we mean he dons a sombrero and speaks in a quasi-offensive “Mexican” accent. The sight (and sound) of Pan Andreas doing this… well, not to put too fine a point on it, but he should probably work on his American accent before he attempts Mexican – and it’s absolutely hilarious. There are many other moments to treasure during the course of The Crime Killer, but that truly was, and is, a standout. And it’s all set to an alternating disco/sax/synth score. There’s even an end credits song which we think is called “Zeus – The Man”, but we couldn’t find an exact title, sung by Mel Carter and Sylvia Sahcmwell. They were clearly going for a Shaft vibe, with the only difference being that there are some lyrical mentions to Zeus’s love for ouzo. You have to love it. 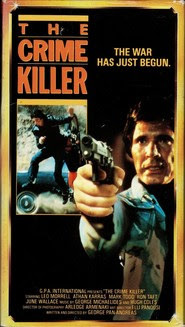 The Crime Killer is a wacky winner just waiting to be rediscovered. It was right up our alley. In Africa, an evil group of commies wants to, and we quote, “force Gamba to break international relations with Anzala.” What does this mean exactly? Well, from what we can tell, Gamba and Anzala are two fictional African nations. When the dastardly Comrade Cornel dispatches his two best (or should we say worst) commies, Courac (Radebe), and the Cuban Gomez, to kidnap the ambassador to Gamba’s daughter, things get real. True South African Hero Captain Holmes (Calder) is tasked to rescue Mr. Masada’s daughter and restore order in the area. To do this, he takes some prisoners who are on death row with him on this supposed suicide mission. If they succeed, their sentences will be commuted to “life with special privileges”. Still seems kind of harsh, but that’s the way the Angolans roll, apparently. These men, Gronsky, Manny, and Baby Face, are up to the task, but they find an abandoned young boy along the way and they take him with them. Will the COBRA FORCE release the ultimate deadly strike? Cobra Force has a lot of what you might call “third-world charm”. Sure, they might not have had access to A-list actors, top-notch technical equipment, or powerful Hollywood resources. But they didn’t care. They made their movie anyway, and God bless them for that. This homemade, homespun feel comes across mostly in the editing. It’s almost Godfrey Ho-esque at times: there are the sections that are edited (relatively) normally, and then there are the other, seemingly unrelated parts that look like Vince Offer got a hold of the film and went hog wild with his Slap Chop. Or possibly his Graty. Or maybe both. To top it all off, there are some “my first editing machine”-style transitions that are the next best thing to star-wipes. There is some classic repeated footage, and every time text is on the screen, something funny happens. For example, the words “KGB – Angola” stays on the screen for a comically long amount of time, the movie is brought to us by a company called Afrovision, and the title Cobra Force is in quotes. Sorry, “Cobra Force”. As for the action, there are a lot of shootings and chasings, and in the unrelated parts some people crash through windows. It’s all set to a pretty funky score by Tony Rudner and you have to appreciate the effort that went into all of it. However, things slow down considerably after the second half, where our heroes do a LOT of walking across the savannah. At a certain point everything stops and it becomes walk, walk, walk for an extended period of time. It’s pretty uneven, but that’s all part of the Cobra Force experience. 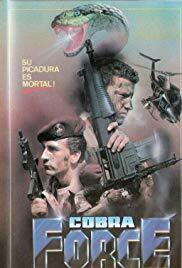 Featuring an extremely catchy (and somewhat strange) end-credits song which mentions the words Cobra Force in its lyrics (we always appreciate movie songs where the title is included), Cobra Force is an example of what filmmakers off the beaten track – WAY off the beaten track – in other countries can do if they have a bit of ingenuity and want to make an action movie. Its amateurish ways are enough to entertain you more than a lot of professionally-made products. We say give it a chance. Get ready for more Godfrey Ho madness as Mr. Ho tries his hand at a full movie for this outing and not a patchwork quilt. That being said, perhaps he should have gone with his more famous cut-and-paste method this time? The plot, as far as we can tell, is this: There are some pro-American soldiers named Woody, Tom Thompson, and Alexander Samson. Maybe it’s because of his name, but it is determined that Samson is the best of the bunch and so he goes undercover in the Commie People’s Freedom Army in order to infiltrate the group, and he travels to Malaysia to do so. Once there, he meets the leader of the PFA, Abdul, who takes a liking to him. After spending time at the Bangsa Moro training camp, he is then shipped yet again to Commander Hajiman’s unit. It’s there he meets the core soldiers of the PFA: Ahmed, Chico, Jerry, and Terri. Trying to thwart the AMERICAN MISSION is a blonde guy with strange speech patterns named Commander Victor, and his second-in-command, Sanderson. All of what you just read is just window dressing for the endless scenes of shooting machine guns in the jungle. Will the AMERICAN MISSION succeed? 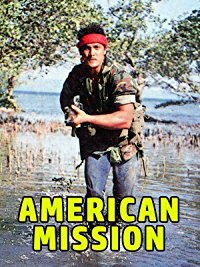 If you like unnamed, unidentified people shooting machine guns at each other in the jungle, you will love American Mission. That could get boring after a while, and it kind of does, but because of the insanity with which the interstitial dialogue scenes are executed, the viewers’ interest is kept, but just barely. If you’ve seen Godfrey Ho movies before, you know what we’re talking about and know what to expect. The movie is kept afloat in large part because of the dubbing. The voices put into the characters’ mouths are very silly and ridiculous. Most animated cartoons for kids don’t have such over-the-top ludicrous voice work. So when these very silly people are then shooting and grenade-ing each other into oblivion for many minutes at a stretch, you can’t help but be sucked in to the vortex of sheer senselessness. When the two sides are shooting at each other, you honestly can’t tell who is who, what side they’re on, or what political cause they’re fighting about. Apparently both sides believe the key to achieving their political aims are to blow up as many huts as possible. Clearly that will change the course of the world geopolitical situation. We also appreciated the multi-colored smoke bombs on display. Of the many smaller-sized blow-ups, instead of the standard white, gray, or even black, here we get orange, purple, and blue as well. It added a visual difference that we appreciated. There should have been more things like that (though the guy with his arm in a cast with a gun was a nice idea as well). Every now and again in the movie, there’s a white title card saying where we are. Unfortunately, it’s white text set against a largely bright background, so we as viewers can’t read it. It appears on the screen for only a fraction of a second anyway, so it’s kind of a wash. Maybe it was meant to be subliminal. While the movie itself is all of one piece – which Godfrey Ho later perfected with gems like Honor and Glory and Undefeatable – the music score seems to be a return to his classic patchwork way of doing things. No one person is credited with an original score, so it’s reasonable to assume this. The music is really fun, yet another indication that the audio aspects of this movie are more entertaining than the visual ones, for the most part. If it wasn’t for the colored smoke bombs, you could almost listen to this movie on the radio. American Mission is approximately the 40th movie Godfrey Ho directed…in 1988. This fact is almost as ridiculous and hilarious as many of the movies he puts out. If nothing else, you have to respect his work ethic. As for the movie itself, the VHS (or the, oddly enough, German DVD) should come with a sticker on the front: “Must Love Nonsense”. If that’s cool with you, do embark on the AMERICAN MISSION! John Ryan (Wincott) is a Toronto-based lawyer. He’s also very adept at kickboxing/Punchfighting. Unfortunately, Ryan’s life is about to come crashing down all around him. He owes $78,000 to a loan shark named Larry the Lender (O’Keeffe), and, whether through his own actions or because of outside forces, he just may lose his prestigious job, his swanky apartment, and everything else he holds dear. When his childhood friend Luis Calderone (Prieto) – now a criminal baddie - buys Ryan’s debt, besides creating strife between the two men, it opens up the only possibility left to Ryan: fight in underground Punchfighting matches to pay off his debt and restore his honor. When Luis’s girlfriend Kelly (Cox), who is basically his kept woman, gets involved, things get REALLY complicated. Will John Ryan win back his own life…and will he use STREET LAW to do it? 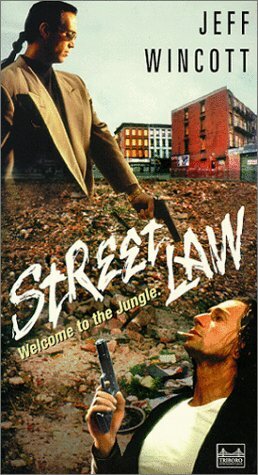 Not to be confused with the fantastic 1974 Franco Nero movie of the same name (AKA Il Cittadino Si Ribella), this particular Street Law is yet another disappointing Damian Lee movie that isn’t worthy of the talents of the great Jeff Wincott. Sure, Street Law opens with a lot of promise: Wincott cruising down the streets of Canada on his Harley, wearing cool shades, with both his long hair and the fringes of his buckskin jacket blowing in the breeze. It’s even narrated by Wincott. Soon, however, this promise is squelched. For no real reason that we can discern even now, we then cut to a scene of Wincott prancing around the forest wearing nothing but a loincloth. Apparently it has something to do with a native-Canadian named Grey Feather (Fisher), who also is only loincloth-clad. Once the actual plot kicks in, there are a lot of dialogue-heavy scenes with unlikable characters the audience doesn’t care about. As much as we may love John Ryan’s lawyerings, we couldn’t help but long for better Wincott outings such as Mission of Justice (1992) or Last Man Standing (1996). Almost all of the fight scenes are officially-organized bouts in the ring (wherein the winner, after defeating his opponent, has to capture a flag tucked into the ceiling above the ring for no real reason) – this is contrary to what the title STREET LAW conjures in your mind. There are a lot of unnecessary zooms and slo-mo sequences in said fight scenes. Just let Wincott and the other fighters do their thing. Don’t muddy the waters with a bunch of cinematic techniques that just get in the way. And not for every scene, but for too many of them, there is a shotgun noise and a quick flash of light as a transition. Not only is this annoying and unnecessary, but Damian Lee did a similar thing in Fatal Combat a few years later (1997), where instead of a gunshot it was loud television static. And as much as we love Wincott, the movie needed another name, such as a Robert Davi or an Eric Roberts to spice things up. The final nail in the coffin is Wincott’s famed trademark of stickfighting is there in a literal blink-and-you’ll-miss-it two second blip. It looked like there might have been more stickfighting filmed but it was cut. So, put all this together and it’s kind of hard to care about the proceedings. However, it’s not ALL doom and gloom. Wincott’s buckskin jacket puts Seagal’s to shame, and he does have a cool long-hair-and-vest combo that is very 90’s and very winning. He also gets to show his acting range somewhat as a lawyer, although he did play a professor in the aforementioned Fatal Combat, a film which does have a lot of similarities to Street Law. Wincott does seem to throw himself into his role, and his Martial Arts are well-executed, but only a handful of moves are really used to their full potential. By far the high-water mark of the entire movie involves a bow and arrow, but we won’t give it away, because if you decide to see this muck, we certainly don’t want to spoil the unqualified best part for you. Featuring the song “Undertow”, the title track of their 1994 self-released album by Canadian band Big Faith (Tool released theirs in 1993), among other songs by Big Faith, we would say that Street Law is for die-hard Wincott fans only.